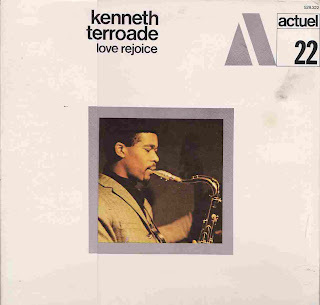 "Kenneth Terroade - Love Rejoice Paris 1969.. THANKS B, I DONT KNOW TOO MUCH ABOUT TERROADE, apart from the fact that he appeared on a few albums, on byg, sunny murry's sunshine , and witches and devils, and "never give a sucker an even break"
and a record by mongezi feza which a friend of mine owns ,i cant remember what its called. .hes also on a few great rock albums, playing flute ..i think..
and ,daevid allen(from gong)'s bannana moon. as a vinyl only "reissue"of dubious provenance on the abraxas lable. claim they never even got paid. in any case this ,does seem pretty hard to obtain. 192kbs is pretty low fi, so if you want to enrich the owners of 'abraxas', who make very poorly pressed vinyl reissues, and dont pay any artist royalties, buy the album if you can find it!!!!!!!!! (i have half a dozen abraxas "reissues" as well as a couple of originals , the originals sound much more vivid, the abraxas pressings have inexplicable pressing faults, and in the case of my copy of jimmy lyons- other afternoons, actual pops and clicks even though the record was new when i bought it and is apparently unmarked, a tape of the same which i made 15 years ago sounds better than that pressing. issues of royalties and legitimacy aside, the music is not being done justice ,by these amateurish vinyl pressings. One of the greater records in the BYG catalogue. More people should hear this one! the situation w/ these records (in terms of the appropriate people actually getting paid) is just awful. i don't feel too great about some of the boots i've purchased in various places (coursil's *black suite* for one, wch i bought on cd even though it's never officially been released on cd), but what are you going to do? so much amazing creativity was put to tape on the whole byg "scene." in some ways sharing the music in this way at least spares the musicians the indignity of someone else making money off of their labor (and the music is actually TO BE HEARD, not filed away). so thanks again! the download's almost done! brent i absolutely agree with you there ive bought my share of boot's in the past, and i think its wonderful that we are all sharing them. i dont know presicely what the status of abraxas is in terms of legitimacy ..but its pretty clear from what ive read that there are no royalties payed. byg catalogue has changed hands so many times, and i think the rip offs been perpetuated all the way down the line. at one stage it looked like denon was going to properly reissue the catalog, but that never happened. although i do have cecil taylors paris concert also known as student studies on a japanese byg boot. im not even sure that that taylor album was originaly on byg. byg issued at the same time as the actuel series a whole stack of unlisenced recordings from the american savoy records catalog, of mostly mainstream jazz, so byg were making money selling boots of charlie parker and yusef lateef records. and "america' also ripped off the riverside , prestige, and bluesville catalogs puting them out without permission. as well as releasing audience tapes and making them out to be legitimate. parker and lester young concerts for instance. later(the late 70's) the same guy georgio karakos who founded byg ,started another lable celluloid(not the american celluloid, but a french one made to look like a subsiduary using the same logo and everything) which indulged in similar practices of bootlegging existing recordings. Tusques appears on two Shandar LP's and if i am not mistaken on the two Shepp LP's. i believe that Terreroade went back to Jamaica and joined the church. Both Daevid Allen, Steve Lacy and Sirone (who didn't record with BYG but went over to France for the Festival Actuel)give some important insights into the operations of BYG in interviews that were published in the Australian arts/music journal xochi23. Lacy called the folks that ran BYG 'gangsters' and Sirone concurred. is there any way you could scan and upload a few pages of the relevant journal? can't wait to hear this one! such an undervalued player on great albums by sunny murray...i'll definitely be picking up the eremite cd of big chief (time to retire my vinyl copy!). while i'm at it, thanks for all the great music here (frank wright and marion brown!!! )...it's been like rediscovering my record collection, and some that got away! thank you very kindly for this session...one of the few byg records i have yet to hear! as always with this label, the sound leaves a lot to be desired but the musicians find ways to make it desirable nonetheless! He's still around. Lives in Jamaica and does mission work. His wife and he came to my church a couple months ago to speak and spend time with us. We were able to listen to a great private concert. He is an amazing musician. I'm going to Jamaica to spend some time with them this summer. Kenneth is my father and i love him. He left the recording industry and has been a missionary in Galina, Jamaica for the past 30 years. ...and that was the third best move he made. the first was finding the Lord and the second was his wife,Eileen. one of the finest men of God i know. Any chance getting this from RS or Zippy? thx. Thanks sotise for this upgrade! For rejoice this wonderful music! 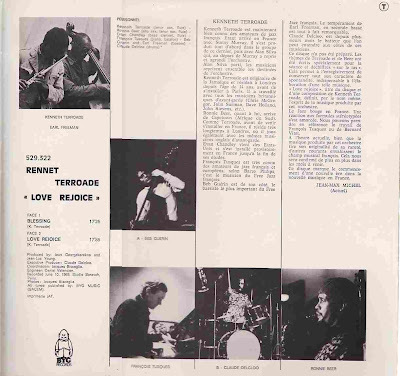 Kenneth Terroade used to play with Full Moon Ensemble out of France. I spent this last weekend with Ken in upstate NY. He lives in Jamaica where he and his wife are missionaries. Still plays the sax and flute very well; he is a wonderful person to be around. I knew Kenneth when I was as a teenager in London in the late 60's. Even then he was very talented musician. I have looked for him over the years, as I have done periodically for other friends of my youth. As a practcing Christian I'm so happy to know that he became a missionary and that he now serves the Lord in Jamaica and elsewhere. May the Good Lord continue to bless him and his family as He also has blessed me and my family. Joan (Porteous) Rawlins.